I'm not here to review the series, if your here you've prolly already seen seasons 1-3, if you haven't, i highly suggest you buy those first and than proceed to buying this. since this season 4 and 5 boxset has ties to season 1 and small stuff of season 2 and 3. any who, this boxset is rather large, i wasnt expecting it to be. i suppose it has to be since for some reason they made this a dual bluray/dvd set. so you get all 4 volumes on dvd of slayers seasons 4 and 5, as well as 4 volumes on bluray of the same seasons. though i have to say, they could of easily have put all 13 episodes of season 4 on one bluray as well as for season 5, but whatevs its still good. i do like the slip case that comes with the box set, which is basically just the same artwork you see on the box set insert. the box set outer insert is actually dual sided. the inside artwork is very nice and i like they made that extra effort to do that. shows love for the fans indeed. the special features are the same, the second disc of each season has both clean openings and ending themes, as well as trailers for other shows. so hopefully this helps you. 4.0 out of 5 starsSlayers Frantic, and then...? (This review is for the DVDs only as I lack a Blu-Ray player.) Reviews of the two series included with this set are already available on their respective pages, so I'll get to the important thing first. 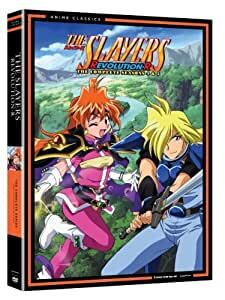 If you're a fan of the old 3 season series of Slayers (Slayers, Slayers Next and Slayers Try), you should get this set. It's great to see the old gang in action again, and the return of the English voice cast is fantastic (if you're a fan of the dub.) The packaging on this 2-season set is minimal, but fine. It doesn't have the flimsy feel to it that the Slayers: Seasons 1-3 Box Set by Funimation did. For the price, this set really can't be beat. It includes both the DVDs and the Blu-Rays of Evolution-R and Revolution, and the quality is fantastic.I avoided buying the separate releases of the series due to the price and this compilation made things a lot more affordable. As for the two seasons. If you've never seen Slayers before, I would recommend watching the original show prior to watching these two seasons. The show doesn't go very far out of its way to explain who people are or what's going on, but that's understandable. If you are a fan of the old series, prepare to be dazzled by seeing your old favorite characters in modern, shiny, colorful digital animation, but also be prepared for the extreme level of hyperactivity in the first half of the first season on this set. While some might argue that the show was slow and dragged on initially in its original first season, Slayers Evolution-R is downright frantic for the first half. The characters hardly pause between stepping on each other's sentences, they're loud, noisy, and generally more a stereotype of themselves than they used to be. The best attributes of all the characters- Lina's passion for black magic, Gourry's memory lapses, Amelia's vows for justice- are made extreme and nearly obnoxious. That being said, I would still recommend this series. Once the actual plot comes into play, the behavior of the characters calms down back into their normal levels of craziness. The plot is enjoyable, especially for fans of the original show due to returning plot threads and characters, and continues into Revolution. As for the dub cast, Lina, Gourry, Zel and Amelia are all returning. Xellos, Sylphiel, and all minor characters are not. Zel and Amelia sound absolutely identical to how they did 10 years ago when the original Slayers series were dubbed, but Lina and Gourry's actors don't quite have the same handle on their old roles. Gourry usually sounds higher pitched and a bit more squeaky and panicky than he used to. Lina, in the introductions and first episode, sounds extremely squeaky and hyper (moreso than she did originally!) but regains her old Lina voice partway through the show. As I watched it I got more accustomed to their "new" voices, but it may be a little off-putting initially for fans of the original dub. With the exception of Prince Philionel (as far as I know), the entire Japanese cast returns for this if you're more interested in the original dialog. If you love Slayers- get this set. It can't be beat for the price and it's wonderful to see the gang in action again. If you've never seen Slayers- check out the original and see if it's your thing. These two seaons really feel like a single season of the show but they are so much better than Slayers Try ever was. I watched Try once and i had to force myself to get through it all. I never could put my finger on what made that season so boring. The final two seasons of slayers are a must own for any fan. Season 4 and 5 are only 13 episodes each totaling to a great 26 episode finisher for this long enjoyable series. The four and fifth season are more comical than the previous three seasons and are well worth the price. Its best if one thinks of season 4 and 5 as just one season all together since the arc does not change. There are criticism that the fifth season is just like the first re-using the same enemies and have Lina fight against Rezo the Red Priest and other demon lords. Nonetheless, the four and fifth seasons are must own for any fans that did not like were the third season ended off. Very nice continuation of the series. It has the same feel and pacing of the original Slayers anime, although you can definitely see the art upgrades. Also, Xelloss is a bit more blatantly evil, but I guess since he was 'outed' as a Mazoku, he doesn't need to play cute as much. 5.0 out of 5 starsI know about all of the episodes. I like this one because I watch the latest season. The Blu ray is pretty, the cast is good, the story is so-so and the extras are meh. Funimation really dropped the ball with this release, but not with the quality of the release, just the speed of which it was released here in the states, about 2 years too late.